In any normal manufacturing setting, material handling can present a trove of safety and efficiency issues. 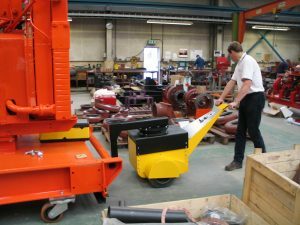 From injuries resulting from a single worker trying to lug 500 lb loads across a plant, to efficiency losses from dedicating a full team to schlep a 1-ton piece into position, material handling tools and strategies can be a critical component to the productivity and well-being of any plant. But what happens when you take that to the extreme? Massive manufacturing projects—whether it’s building planes and trains or tempering 150,000 lb of aluminum tubing—present a whole new level of material handling complications. In those environments, the conversation quickly goes from losing productivity of a handful of workers to a team of 30 to move a single unit, and from strained backs and crushed toes to the potential for catastrophic injuries and damage. “A lot of these companies try to use forklifts or other gas-powered equipment that aren’t environmentally or employee-friendly to move these loads,” explains Ryan Blesi, vice president of material handling at Nu-Star Inc. “Other companies install expensive chain drives underneath the floor to handle them.”For these manufacturers, there aren’t a lot of options out there to help. While these techniques do get the job done, they aren’t exactly ideal situations, Blesi says. The chain drives are also problematic, he says. These solutions are fixed and permanent, so there isn’t much a company can do to change operations once they are installed. Beyond that, “they require a lot of maintenance to keep up and, if they break down, the whole plant is basically out of luck,” he says. So there is the problem. Now the industry needs a solution. And Blesi has just the thing. Material Handling expert, Nu-Star Inc., has an extensive line of pushing and pulling equipment designed to give single workers the power to move loads up to 50,000 lb. That seems super-heroic enough. But, for clients facing some of the extreme challenges described above, it needed to go a bit further. For this, the company offers its apt-named Super Power Pusher. The design squeezes three times more power than the standard Power Pusher into a compact frame that occupies the same footprint. 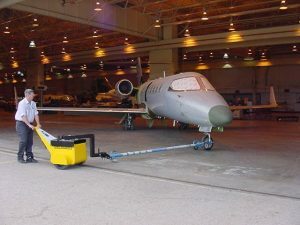 That means a single operator can push and easily navigate wheeled objects weighing up to 150,000 lb through plants and through operations without strain, assistance, or exhaust fumes. 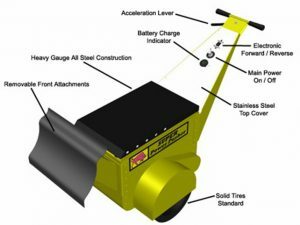 For extremely extreme environments, it even offers a dual motor version that can add another 100,000 lb capacity to the pusher. These Super Power Pushers allow single operators to move train engines or double-wide mobile homes, even space shuttles, with the easy of any “normal-sized” material handling operations. Heck, it would only take two dual motor units to move the entire Statue of Liberty. This super-powered solution has the potential to significantly impact these extreme operations, Blesi says. What’s more, he adds, “it’s the right tool for the right job.” And that’s something the industry has been sorely lacking.